My mileage went up just one more mile this week, which the most I’ve done through my pregnancy. It’s no wonder my body was feeling more worn out by the end of the day. But I switched to run/walk intervals which helped on my weekend runs and next week is a cutback week with warmer weather. Let’s get into it! A busy week to end October and start a new month! I’m definitely feeling the double speedwork week and am finishing off the week with some relaxation after my long run. Let’s get into it! I was not feeling the greatest this morning but was feeling good enough by late afternoon to some light cardio and bodyweight exercises. I could have ran my 5K pace intervals a lot smarter. I let myself go out too fast in the first two miles and the last one was a slog. Hopefully my 10K pace run on Friday turns out better (and it will if I stick with my pace)! Nice, easy run to finish off October! Pacing felt a lot better although I was having some stomach issues towards the end. But I made it through without any problems! First workout of November is done! I had a late meeting this night so I worked out first thing and went into work later. Back to my regular strength training with the Triple Threat workout on the NTC app and the stairmaster at LA Fitness. Seriously, 45 minutes on the stairmaster is a killer, it got my heart rate up there more than my usual elliptical workout! Normally I don't run on Fridays but Mike's participating in ExtraLife and I'm heading up to St. Cloud with Vinnie tomorrow. So I did my 10K pace run today instead! I was worried about running at my 10K pace (8:50) since I haven't had a rest day and was running hard after a full day of work. But I pulled it with much better pacing this time (although I had to really pull myself through the last mile). Now to relax tonight, eat some food and get ready for a rest day tomorrow! Rest day for me but I didn’t feel like I got a whole bunch of rest in! Vinnie and I dropped off Mike so he could go play video games for 24 hours and we headed up to St. Cloud. Once we got up there, my mom and I took all three of the dogs a walk before we headed out shopping. And then it was back to the Cities for us. I did get to relax after dinner and finished off the with a pre-bedtime yoga flow which was so relaxing. Cold and wet long run, I was glad to get out for this but I wasn't feeling that great at the end. I'm just not ready yet for winter running and this was a little (much wetter) taste of it. By the time I got done grocery shopping and did some foam rolling and stretching at home, I was done with working out. I tried getting in a core session but my body just wasn’t having it. So I showered and had some chocolate waffles with peanut butter and berries instead! Getting close to finishing out October already and I started switching up my training for the Reindeer Run 10K on December 8! I’m so excited to be training for a PR again and could tell enthusiasm for running picked up again after signing up for the race. I love running but training for a PR just gives me a goal to aim for. So let’s get into this week's workouts! Weights and spin class today, pushing it hard felt really good. I’m really enjoying the Triple Threat workout on the NTC app because it really gets my heart rate up since I’m doing three exercises back to back before getting in a short rest period. Plus I went a little bit heavier on the weights today! Intervals were a little bit uneven as I felt really good starting out and went faster than intended.My fast intervals were at about a 8:00 pace and my recovery was around a 9:00 pace. By the time I got to the halfway point, my calves were tightening up and I knew I had to slow it down a little. Still felt good and I'm proud of that pace! 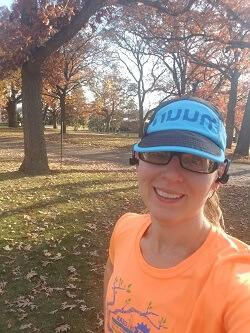 A nice, easy run enjoying the fall weather. I went out too fast at first but corrected it in the end. Good thing I had some Nuun on hand for cross training today. Between it being almost 70 outside and how hard I worked (especially on the treadmill hill intervals at 15% incline), I needed something tasty with electrolytes! Weights workout today was Better Basics from the Nike Training Club app and then 30 minutes of walking hill intervals. Felt great to up my weights just a little bit and it's going to be keep me strong and injury free as I prepare for the Reindeer Run 10K! A nice relaxing rest day which meant lots of walks in the gorgeous weather and an upper body focused yoga session. My upper body was still pretty tight but doing this yoga video and some additional foam rolling really helped out. Damn, it feels great to be training for a PR again! Today was a 10K pace run where I was aiming for 8:50-8:55....and I ran faster even with the strong winds. As I said in an earlier post, I’m trying to run my pace runs around Lake Harriet where the 10K is going to be held which is pretty flat (only 32.9 feet of elevation gain) so it felt easier to run this fast. Also, that pace is only 5 seconds off my 5K PR! Looking at my splits, you can tell that I was getting tired in that last mile (which was also going right into the wind most of the time) and I need to work on getting my splits evened out a little bit more at this distance. AKA not going out so fast at first. I also got in a five minute plank workout at the gym and a good foam rolling session after my run to help with my recovery. After yesterday's hard pace run, I took my long run out to Afton State Park to have some fun! The uphills were tough, especially after yesterday's flat, fast miles but it felt great to get out there. My weekly effort was a little bit higher than last week’s and I can tell my workouts were harder this week, but I’m still in the steady progress range according to Strava. However, I can tell today (Sunday) that I’m feeling more sore than I have in the past. I’ve been trying to focus more on recovery after my runs by foam rolling, taking epsom salt soaks and wearing my compression socks. So hopefully that helps keep most the soreness away.